Gases and liquids move from the region of high pressure to the region of low pressure in straight way generally. But this is not the situation in the case of winds blowing on the Earth. There are two types of winds blowing on the Earth. Some winds blow heavily whereas some winds blow lightly. That means some winds blowing on the Earth are stronger while some winds are weaker. As the Earth rotates around itself, a force called Coriolis force is produced. This force opposes the winds blowing on the Earth. So they could not blow in linear way. 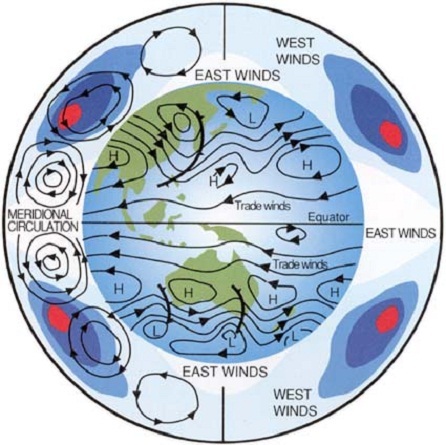 That’s why winds in the high pressure systems and low pressure systems on the Earth blow in spiral shape. Thus due to the spinning effect of Earth around itself, winds on it has to blow spirally irrespective of pressure. At the North Pole, winds in the low pressure system move spirally inwards in anticlockwise direction, blowing up towards the exterior. Where as winds in the high pressure system move spirally outwards in the clock direction, blowing towards the interior. Coming to the case of Southern Pole, winds move exactly in opposite direction to that of winds blowing at Northern Pole.